The basic properties of molecular materials in the solid state are often strongly influenced by the details of their crystal structures and the existence of polymorphs. Experimental determination of these structures is costly and time-consuming, which places increased importance on the role of theory and computation. Similarly, the biochemical function of small oligopeptides, from immunogenicity to inhibition, is affected by their equilibrium conformations in different environments. In developing techniques to study these effects, following a suggestion by Dunitz and Scheraga PNAS 101, 14309 (2004), we have adopted the perspective that these seemingly different phenomena are two aspects of the same underlying rare-event sampling problem. 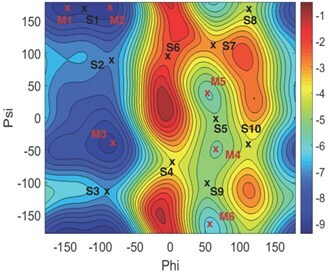 Rare events are characterized by major basins on a potential energy surface that are separated by high energetic or entropic barriers (see accompanying figure). Techniques designed to treat one type of system can be adapted for the other. This research direction focuses on the development of free energy based enhanced sampling and surface navigation strategies that can be applied to either class of system when appropriately tailored to its particular requirements and conditions. Free energy is emphasized because it is fundamental in thermodynamics and is the appropriate figure of merit in ranking crystal structures and determining favored conformations of peptides. In many studies, one often seeks this quantity as a function of a set of collective variables (CVs) capable of distinguishing the structures of interest in a system. The CVs should also capture slow modes of motion that represent sampling bottlenecks. The number of CVs is typically a few to several tens, hence the dimensionality of the resulting free energy function is sufficiently high that generating and representing it constitute major challenges, which this research direction aims to address. where the πα are momenta conjugate to the Gaussian centers and μα are a set of fictitious masses associated with these momenta. Rosso et al. J. Chem. Phys. 116, 4389 (2002). Maragliano and E. Vanden-Eijnden Chem. Phys. Lett. 426, 168 (2006). B. Abrams and M. E. Tuckerman J. Phys. Chem. B 112, 15742 (2008). Chen et al. J. Chem. Phys. 137, 024102 (2012). Cuendet and M. E. Tuckerman J. Chem. Theor. Comput. 10, 2975 (2014). T. Tzanov et al. J. Phys. Chem. B 118, 6539 (2014). Ref. 4 also describes an approach for combining the adiabatic free energy dynamics approach with the popular metadynamics method. In Ref. 6, we employed adiabatic free energy dynamics to study the four-dimensional free energy surface of the dipeptide N-acetyl-tryptophan-methyl-amide using a range for force fields. 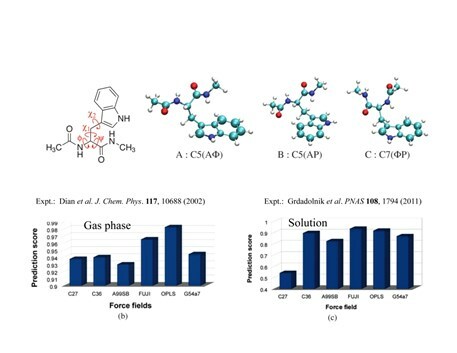 The accompanying figure shows the molecule and the corresponding CVs, which are the dihedral angles shown in the figure, the major free energy basins in the gas and solution phases, and the comparison score between each force-field prediction and experiment. Note that without the benefit of enhanced sampling, it would have been intractable to run simulations for each force field long enough to achieve full convergence of the four-dimensional free energy surface. We have also applied the adiabatic free energy dynamics scheme to the alanine decamer in the gas phase, again using the 20 backbone Ramachandran angles as CVs. The free energy minimum for this system is an alpha-helix. The accompanying figure shows the RMSD from the alpha-helix along four independent trajectories when standard MD is used and when the adiabatic free energy dynamics approach is employed. The figure clearly shows the dramatic acceleration in sampling achieve using the latter enhanced sampling scheme. 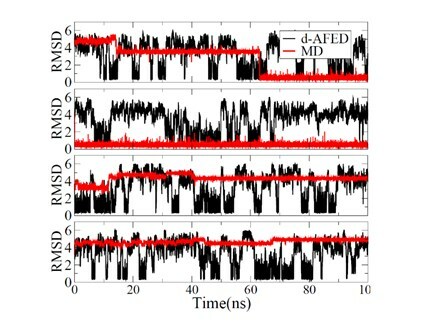 Trajectories of the alanine decamer in the gas phase with standard MD (red) and adiabatic free energy dynamics in the extended phase-space formulation (d-AFED, black) for four independent trajectories. Since the averages are over simulations of finite length, they have inherent sampling error, which gives causing the optimization (activation and relaxation) to be stochastic in nature. Thus, in order to identify the minima and saddles, a clustering approach is needed. One possibility is the DBSCAN approach, or alternatively, the scheme of Rodriguez and Laio, Science 344, 1492 (2014) can be employed. As an application of START, we generated the landmarks of the five-residue oligopeptide met-enkephalin (Tyr-Gly-Gly-Phe-Met), shown in the accompanying figure, in the gas phase. The CVs are the ten backbone Ramachandran dihedral angles. START was able to locate 1081 minima and 1431saddle points. These minima and saddles are collected into a graph with minima represented as blue nodes, saddles as red nodes, and edges connect nodes if a segment of a START trajectory connects them. This graph is shown in the left panel of the accompanying figure. The large number of landmark points makes interpreting this graph difficult. In order to aid in understanding the structure of the free energy surface, we employ the sketch-map technique [Ceriotti et al. Proc. Natl. Acad. Sci. 108, 13023 (2011)] to sort the graph nodes according to a feature space of the configurations obtained. Sketch-map introduces an optimization function χ2 = Σij [F(Rij)-f(rij)], where F is a sigmoid function of Rij, the distance between configurations and f is a sigmoid function of rij, the distance between graph nodes. Optimizing this function maps configurations that are far apart in configuration space to nodes that have a larger distance in the graph. The right panel of the figure shows the graph nodes after sketch-map is applied. 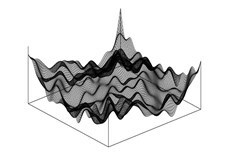 Once the landmarks are identified, the adiabatic free energy dynamics method can be applied to the landmarks in order to obtain the free energy differences. These differences can be converged for the ~2500 landmarks obtained within a few hundred nanoseconds much more rapidly than a search on the fully ten-dimensional landscape. The actual free energy differences are shown in the upper left corner of the left panel while a correlation plot of free energy differences obtained between a 200 ns run and a 500 ns run of d-AFED on this system is shown in the lower left corner of the left panel. An important advantage of START is that the free energies can be obtained both in the gas phase and in solution phase. An illustration of this is provided in the accompanying figure, which shows the free energy surface as a function of the Ramachandran angles of the solvated alanine dipeptide using the OPLS/AA force field generated via d-AFED together with the landmarks generated via a START calculation.